Mar. 1975 Ph.D., The University of Tokyo. Jun. 1975 Research Associate, Department of Chemistry, King's College. London. Jun. 1981 Research Associate, then Research Fellow, Department of Biophysics, King's College, London. Apr. 1985 Senior Staff Scientist,　Institute of Cancer Research, UK / Visiting Lecturer, Department of Biophysics, King's College, London. Apr. 1986 Associate Professor, Department of Chemistry, College of Arts and Sciences, The University of Tokyo. Apr. 1992 present Professor, Department of Chemistry, College of Arts and Sciences, The University of Tokyo. Apr. 1996 present Professor, Department of Life Sciences, Graduate School of Arts and Sciences, The University of Tokyo. Reiko Kuroda has conducted leading research on the identification, creation, amplification, transcription and related elucidation of mechanism of chiromorphology on the molecular and ontogenetic levels. [Chiromorphology is a term coined by Prof. Kuroda to signify the morphology (shape) of chirality.] In doing so, she has opened up a hitherto unexplored research field to the world. Over the course of her research, Prof. Kuroda has paid attention to the flaws in conventional measuring instruments pertaining to chirality and particularly to problems in measuring bio-related specimens. Her keen awareness of the necessity of research that delves into the design and manufacture of measuring instruments led to the achievements described herein. In developing the Universal Chiroptical Spectrophotometer (UCS), Prof. Kuroda has made it possible to measure all aspects of the polarization phenomena of solids, powders, liquids, gelatinous materials and bio-related specimens, thus making inroads for investigating various phenomena of physical and living systems involving chirality. In other words, by improving the CD spectrophotometer, which conventionally could not be applied to solids -- owing to large macroscopic anisotropy (LD and LB) -- and making it possible to apply it to crystals, films, liquid crystals and specimens of biological materials in lifelike states, the multipurpose Universal Chiroptical Spectrophotometer（UCS）could be developed and manufactured for measuring all optical properties pertaining to the chirality of solid and gel-state specimens: circular dichroism (CD), circular birefringence (CB), optical rotatory dispersion (ORD), linear dichroism (LD) and linear birefringence (LB). This device makes it possible to eliminate anisotropy by rotating the analyzer. It is equipped with a computer-controlled specimen rotation mechanism, as well as mechanisms that make it possible to take surface and underside measurements on specimens. In addition, to avoid deformation from the impact of gravity on fluid specimens and changes in density distribution and the like, specimens can be measured while kept level. With light-intensity calculation methods that make use of such a device and the Mueller matrix, a measurement method was established for obtaining true spectra, without macroscopic anisotropy. With the aforementioned device, Prof. Kuroda succeeded in expanding the applicable scope for the measurement method extensively to include both physical systems and living systems. For such biopolymers as bovine serum albumin (BSA), for example, Prof. Kuroda succeeded in realtime tracking of the aggregation process from β-amyloid protein solution, along with measuring cast films. Use of the device that Prof. Kuroda developed will aid new developments in solid-state chemistry in future, with chirality serving as an inroad. The provision of extremely potent methods for elucidating the role of chirality in the living world will also be possible. This, in turn, will facilitate major contributions to progress in solid-state chemistry and life science, thus giving rise to major expectations in a variety of fields. 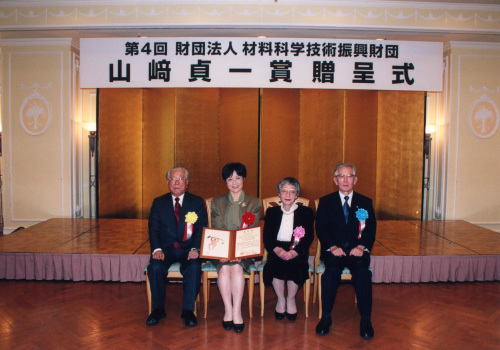 As Reiko Kuroda's achievements, as cited herein, fully satisfy the requirements for candidates for the Yamazaki-Teiichi Prize in Measurement Science and Technology, she has been selected as this year's prizewinner. In a mirror, a right hand is reflected as a left hand. Such an example where an object's real life image is different from its own mirror image is known as chiral. Chirality is a common phenomenon and is evident in everything from micromolecules to macromatter, from the world of the nonliving world to that of the living. In the living world, it is particularly important for homochirality (in which the proteins common to all of Earth's life forms are composed only of L-amino acids and in which nucleic acids are composed only of deoxyribose). In the solid state, molecules are tightly packed and interact strongly. Thus, identification of molecular chirality takes on a different order of magnitude than it does in the solution state. Sometimes, chirality is only expressed in the solid state. Establishing homochilarity in the living world also involves the possibility of how solids relate. Although solid-state chemistry is an unexplored field, the development of new chemistry that differs from that of solutions is anticipated. For the advancement of chiral solid-state chemistry, measurement of solid-state circular dichroism (CD) spectra is necessary. However, the macroscopic anisotropy particular to solids (linear dichroism and linear birefringence) is 100 to 1,000 times larger than CD signals. Moreover, due to the coupling of the systematic error of the CD spectrophotometer (a polarization-modulating spectroscope) and macroscopic anisotropy of specimen, false signals enter in. For this reason, CD measurement of the solid state cannot be measured using the commercially available spectrophotometers, except in special cases. Thus, the development of new spectrophotometers and measurement methods has long been awaited. The Universal Chiroptical Spectrophotometer (UCS) is able to provide true spectra without macroscopic anisotropy. It was developed based on the Mueller matrix and Stokes vector analysis method, and a related measurement method has also been proposed. The name UCS was given to underscore the device's ability to measure all optical properties pertaining to polarization: circular dichroism (CD), circular birefringence (CB), optical rotatory dispersion (ORD), linear dichroism (LD), and linear birefringence (LB). Two models were manufactured: UCS-1 and UCS-2. Representative improvements over the conventional spectrophotometers include the following. Device is equipped with two lock-in amplifiers (50 and 100KHz), enabling simultaneous measurement of both signals. Deviation from the analyzer's light path is possible. Through combination with signals of 50 and 100kHz, all optical properties can be detected. In addition, anisotropy can be removed by rotating the analyzer. CD signals can be measured during computer-controlled specimen rotation. For this purpose, a rotating specimen holder and a removable specimen holder were developed. The surface and underside specimen measurements necessary to counteract anisotropy can be taken. The UCS-2 has the following features, in addition to those of the UCS-1. To avoid deformation from the impact of gravity on fluid specimens and changes in density distribution and the like, the light path is modified using a total-reflection prism. Measurements can be taken with the specimens on the rotating specimen holder kept level. Able to measure powder crystals, single crystals, gels, LB and other films, the USC-2 is completely versatile. It can also measure phase transitions in real-time such as the film generation process from solutions. It was confirmed that measurement and analysis using these measuring devices and measurement methods yields correct CD and CB spectra with anisotropy eliminated through the fact that Kronig-Kramers relation is established for single crystals of nickel sulfate and also from the fact that zero CD for PVA films is indeed indicated, presenting large false signals, even though they are not chiral. In addition, application was extended to biopolymers, and success was achieved in realtime tracking of the aggregation process from a solution of β- amyloid, a protein that causes Alzheimer's disease. Although this protein takes on α-helix structure in the solution state, the state of its aggregation to β-sheet structure within a short time was observed. For a long time, it was believed that chirality could not be measured in the solid state. Lack of awareness of macroscopic anisotropy resulted in various problems, such as the reporting of incorrect spectra from using commercially available devices for measurement. Thus, the development of these two spectrophotometers, which can measure solid specimens, is highly significant. They will likely prove indispensable to chemical research on the chirality of solids, a field for which development is highly expected henceforth. In addition, the second of the two devices is unique in that it enables specimens to be positioned horizontally. By utilizing the fact that proteins, nucleic acids and the like have chiral molecules, it is possible to measure these biological materials in a state akin to that of a living organism, neither liquid nor solid. In addition, phase transition, structural change over time and other behaviors can be tracked; thus, deployment for manifold purposes is expected in future.